Leverage your organization’s smartphone investment and optimize safety monitoring operational costs while achieving the highest level of safety monitoring with Loner Mobile and Loner Duo. Smartphones are often taken for granted and each lone worker’s smartphone is not always handy. 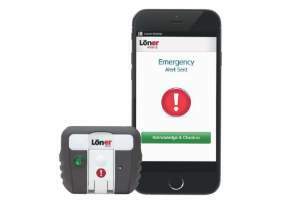 To request help manually, all safety monitoring apps—including Loner Mobile—require the user to access his or her smartphone, unlock it, access the safety app and trigger an emergency request. This takes time the employee may not have. Blackline’s Loner Duo accessory features Bluetooth® Smart communications and pairs with a smartphone running Loner Mobile. It provides the critical physical interface used to instantly trigger a manual request for help with a flip of its emergency latch. Loner Duo also delivers automated safety monitoring features that match our dedicated safety monitoring devices, Loner M6 and M6i. If a lone worker is unable to call for help manually, Loner Duo can detect falls, a person-down (motionless) event and a missed check-in request. All safety alerts are communicated by Loner Mobile to monitoring personnel who are empowered with the precise location of the employee in order to manage a pin-point emergency response to the lone worker’s location. Use of Loner Duo amplifies the base capability of Loner Mobile that already includes two-way voice communications to monitoring personnel, BS 8484 lone worker code of practice for the United Kingdom and communicating notes to monitoring personnel that provide valuable context to work being performed by the lone worker. As with all of Blackline’s Loner safety monitoring solutions, Loner Duo and Loner Mobile are highly configurable to meet the requirements of a broad selection of applications and requirements. Targeting small and medium sized businesses through to multinational organizations, all configuration changes occur over-the-air. Device profiles within Blackline’s Loner Portal safety monitoring application ensure no Loner Duo accessory or Loner Mobile app is misconfigured.